He also interacted with the local people and promised immediate measures to restore normalcy. SRIKAKULAM: Chief Minister N Chandrababu Naidu on Saturday directed the officials to arrange generators to operate the primary heath centres (PHCs) in the cyclone-affected areas. 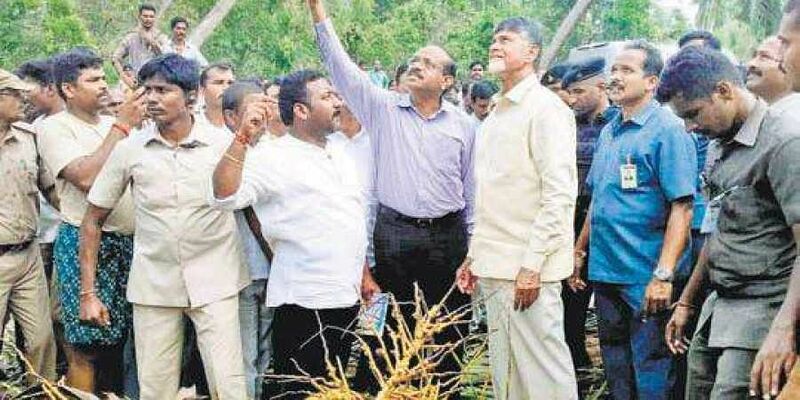 A day after visiting the cyclone-hit areas in Palasa and Vajrapukotturu mandals, Naidu on Saturday visited Kojjiriya, Kaviti, Kamba, Sompeta, Rajapuram, Borraputtuga, Rattakanna and Ichapuram. He also interacted with the local people and promised immediate measures to restore normalcy. He directed the officials to set up generators at comprehensive drinking water projects for supplying potable water. The drinking water and electricity services must be restored immediately, he said. Naidu assured the Uddanam farmers that the uprooted coconut trees would be taken away and the cashew crop would be trimmed. Addressing officials and ministers through tele-conference on Saturday morning, prior to his field visit, the Chief Minister said that his government had deployed nodal officers at all the affected mandals in the district. Agriculture Minister Somireddy Chandramohan Reddy has directed the officials to complete the assessment of crop damage in three days. As per a preliminary survey, paddy crop was damaged mostly in Tekkali, Palasa and Ichchapuram .